The Opteka 500mm / 1000mm f/8 Manual Focus Lens is a classic refractor-style T-mount lens, with an aperture diaphragm in the middle of the lens body to stop down the aperture when necessary. However, it is assumed that much of the shooting with such a lens will be at its maximum f/8.0 aperture, with a tripod, monopod, or other such support. The included 2x doubler converts this 500mm lens into a 1000mm. 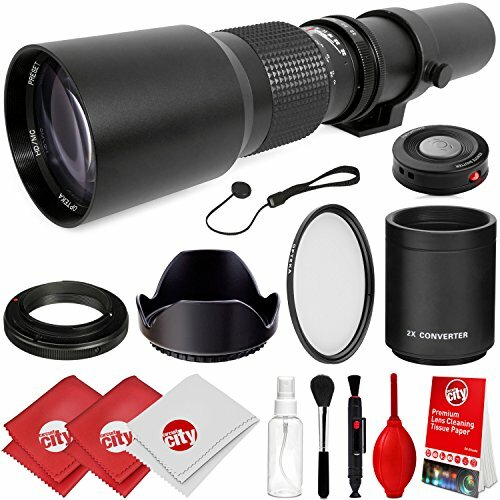 When combined with the included T-mount to fit your camera system, this super telephoto works on both "full frame" cameras as well as the "APS-C" style digital SLR cameras. You can use the lens in "M" manual exposure mode or "A" aperture-priority mode only. This lens' sophisticated achromatic refractor design yields images with pleasing peak contrast and well controlled flare. It can be used at maximum aperture on a very bright day for some images of moving subjects. IR remote will only work if your camera supports an IR remote function. The Circuit City CCIR Remote Control is a wireless infrared shutter release capable of instantly triggering the shutter of select digital cameras (Canon, Nikon, Sony, Olympus, and Pentax), without disturbing the camera, up to a enhanced distance of up to 48' (varies by camera brand) in front of the camera. Circuit City Cleaning Kit - Lens Pen, Air Blower, Dust Brush, Empty Spray Bottle, 3x5" Lens Tissues (50), Standard Microfiber (2), Large Microfiber. View More In Digital Camera Lenses.